In August of this year, Walt Landgraf presented a program at the Stone Museum in People's Forest about the earliest residents of East River Road (known in earlier times as the Wolcott Road and the Farmington River Turnpike). Attending this presentation were several current residents of East River Road, curious about the history of their area. Among those attendees were Bob Judd and Pat Steier, who currently live on the west side of East River Road, along the river, just before People's Forest. Steier was especially interested in Landgraf's discussion of the history of the tiny cemetery that lies within the bounds of her current property. She learned that this tiny cemetery was over 200 years old, and was the final resting place of Jonas Weed, one of the original European settlers of the area, who died in 1806. There was speculation during the museum discussion as to whether other members of Weed's family were buried in that lot as well, though no conclusive proof was known. Photo- The Weed Cemetery on East River Road in Pleasant Valley, (Barkhamsted) CT.
With their curiosity piqued, Pat Steier and Bob Judd, began looking more closely at the cemetery. Judd probed the ground adjacent to Jonas Weed's grave with a fine rod and found it stopped a few inches below the surface, across an area that was the size of Weed's headstone. He told Steier of his findings, and together they began digging a small test hole, to determine if the obstruction Judd had hit was simply an ordinary rock or perhaps a headstone that had long fallen down and been buried. As they dug the small hole and swept away the earth, Judd was shocked to see the words "in memory" revealed. They had indeed found a long-buried headstone! Judd excitedly called Landgraf and left the message "We found Mahitable!" on his answering machine. But who are Jonas and Mahitable Weed? What can we learn of them from historical records? Our research has uncovered just a few facts, and several of them seem to conflict, painting a confusing picture. Photo- Gravestone of Mahitable Weed, discovered at the Weed Cemetery. According to www.geocities.com/Heartland/Meadows/7588/jonasw.htm, a child named Jonas Weed was born in 1597 and baptized on February 20 in a parish in Chelveston, Northhamptonshire, England. Thirty-three years later, he arrived in the Massachusetts Bay Colony on June 12, 1630; a Puritan traveling with Sir Richard Saltonstall and Governor Winthrop. While most of his shipmates settled in Salem, Jonas Weed moved instead to Watertown, Massachusetts. In May 1635, "he was one of six dismissed from the Watertown Church to form a new church on the Connecticut River at Wethersfield." Weed became one of the original settlers of Wethersfield, Connecticut in 1635. In 1637, he married a woman named Mary (whose maiden name may have been Hoyt or Scofield). They had three children in Wethersfield: Elizabeth (b. 1637), Mary (b. 1639), and Dorcas (b. 1640). In 1639, Jonas was listed as a juror in Wethersfield. Jonas Weed's will, dated November 26, 1672, was inventoried on November 7, 1676, five months after his death on June 5, 1676 in Stamford. Jonas' will spelled out the disposition of his house, home lot, 6 additional acres of meadow, and 56 pounds, 50 shillings. Jonas' wife Mary died 13 years after her husband, on March 10, 1689. Jonas Weed, settler of both Wethersfield and Stamford, had four sons' John, Samuel, Jonas, and Daniel (born between 1643 and 1652), who carried on the Weed surname. According to http://rootsweb.com/~ctfairfi/stamford/weed_data.htm, Jonas' son John had six sons: Jonas (b. 1667), Daniel (b. 1669), John (b. 1675), Samuel (b. 1677), Joseph (b. 1678), and Isaac (b. 1682). Jonas' second son, Samuel, had three sons: Jacob (b. about 1679), Jonas (b. about 1684), and Samuel (b. about 1690). Jonas' third son, Jonas, also had three sons: Jonas (b. 1678), Benjamin (b. 1681), and Jonathan (b. 1684). Jonas' fourth son, Daniel, had four sons of his own: Abraham (b. 1680), Daniel (b. 1684), Ebenezer (b. 1692), and Nathaniel (b. 1696). If these records are complete and correct, this means that by the third generation of Weeds in Connecticut, there were 21 men with the surname "Weed," including 5 Jonases, 3 Samuels, 3 Daniels, and 2 Johns. Beyond that, as the web site traces the offspring of the third generation, it gets confusing and there are more gaps in the records. Of the 16 male offspring of the second generation, records of the children of only 12 have been found. There is no information yet located on descendents of Samuel (1677-1756), Isaac (1682-1754), Jacob (b. about 1679, d. unknown), or Jonas (b. about 1684, d. unknown). Even for the other 12, the information becomes sketchy as the Weed family multiplies and spreads out across the region. The genealogical web sites on the internet show no clear connection between the original Jonas Weed in Connecticut and the one who died in Barkhamsted in 1806. Judging by the birth dates of those descendents who are listed, we can logically conclude that the Jonas Weed we seek was born to the third generation (or perhaps an earliest member of the fourth generation) of Connecticut Weeds. The Jonas Weed buried on East River Road may be the son of one Ezra Weed of Danbury, who is listed as the first owner of residence "C-15" (the approximate site of today's 58 East River Road) in Correll Tiffany's 1918 record of Barkhamsted properties. In that record, Tiffany states that Ezra Weed sells C-15 to Jonas Weed of Danbury in 1792. Tiffany listed the property with an "-x" suffix to indicate that the building at that location was no longer standing in 1918. Tiffany also says that Jonas Weed cleared and occupied the property across the road, C-16, in 1777 (the approximate site of 73 East River Road today). Tiffany also ties the names Micajah and Nathaniel Weed to C-15. Micajah and Nathaniel appear to have been Jonas Weed's sons. Jonas Weed Jr., who resided for years in the area of today's Old North Road, was likely to have been another of Jonas' sons. Jonas Jr. seems to have come to Barkhamsted before his father, who may have come here only in the last 10 years of his life, perhaps to be closer to his children as he needed more assistance. Photo- Gravestones of Jonas and Mahitable Weed. What do we know about Barkhamsted's Jonas Weed? 1727: Jonas Weed was born about 1727, possibly in Danbury, Connecticut. 1729, the third child of Mehitable and Ezra Perry. She had seven siblings (Thomas, b. 12/20/1727; Elizabeth, b. 3/20/1728; Jemima, b. 10/2/1732; Mary, b. 2/20/1734; Lydia, b.
his family to Danbury about 1745, along with his brother Elisha. 1773: Jonas Weed Jr. married Sarah Moody of New Hartford on May 6. 1774: Daughter Susannah was born to Sara and Jonas Weed Jr. on April 18. 1775: A Jonas Weed was listed as a private in the 6th Company 5th Regiment Col.
Waterbury from May 22, 1775 to September 17, 1775.
record as W-79 (this is in the Old North Country Road / Old North Road / Wallens Hill area). 1776: Daughter Sara was born to Sara and Jonas Weed Jr. on March 27. A Jonas Weed was a private in Captain Eli Reed's Company of the State Militia in June and July 1776. From August 12 to September 2, 1776, he was a Sergeant in Captain Seth Seymours's Company 9th Regiment in New York. On October 24, 1776, he was a Sergeant in Captain Bell's Company. He was discharged on December 24, 1776 at the Westchester border. 1777: Beginning January 1, 1777, a Jonas Weed was a Corporal in Brown's Company 8th Regiment on the Connecticut Line for a term of three years. Sept 1, Jonas Weed Jr. signs a memorial to State on behalf of the residents of East Winchester and West Barkhamsted, requesting a new Congregational Church Ecclesiastical Society be formed for residents of Winchester living east of Long Pond (now Highland Lake) and Barkhamsted residents living west of the Farmington River. This is recorded in Annals of Winchester written by Boyd in 1871, (page 281). "Dr. Jonas Weed" cleared and occupied property on the old Farmington River Turnpike (currently East River Road). This lot is listed in the Tiffany record as C-16, and is currently 73 East River Road, owned by John and Marion Lizzi. 1778: Jonas Weed promoted to Sergeant on March 1, 1778. Daughter Amelia was born to Sara and Jonas Weed Jr. on April 7. 1779: Daughter Roxelonia was born to Sara and Jonas Weed Jr. on December 31. 1780: Jonas Weed was discharged from military service. Jonas Weed Jr. was listed as a "Lister of Polls" and returned a list on August 20, 1780, which may reside in the State Library archives now. 1782: Daughter Claray was born to Sara and Jonas Weed Jr. on May 13. 1784: Jonas Weed (Jr.?) and Riverious Newell and Daniel Gillet formally divided their Old North Road area property , then listed as 109 acres. Son Joel was born to Sara and Jonas Weed Jr. on August 16. 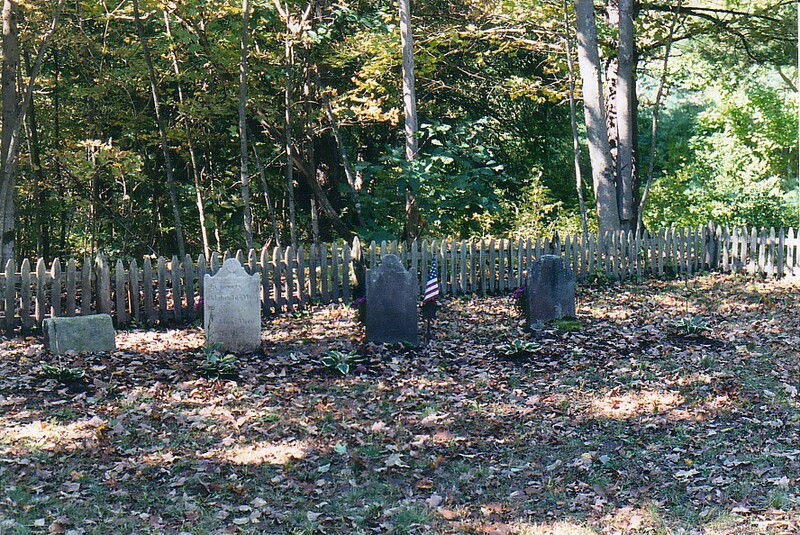 1787: Church records referred to Sergeant Jonas Weed living at this W-79 lot in the Old North Country Road area. This corresponds to his military records. In 1787, Jonas Weed sold 14 acres of this property to Reuben Sweet. Daughter Anna was born to Sara and Jonas Weed Jr. on September 22. 1789: Jonas Weed began three months of school-keeping at Lieutenant Samuel Hayden's house on January 11, 1789. He was living on the original North Country Road at the time (the vicinity of Old North Road/Wallens Hill). 1790 Census showed Ezra Weed living on East River Road. 1792: On March 15, Ezra Weed sold 30 acres on the old Farmington River Turnpike to Jonas Weed of Danbury for 60 pounds. This property spanned both sides of the Turnpike and is listed in the Tiffany record as C-15x. Barkhamsted land records defined the parcel as bounded on the south by the land of William an Eli Phelps, on the west by the river, on the north by the land of Eli Holcomb and Humphrey Quimon, on the east by the original proprietor's highway (which was to the east of the Farmington River Turnpike). The land records also state that this property excluded the "burying place" that measured 4 rods by 3 rods (a rod is equal to 16.5 feet, making the cemetery 66 x 49.5 feet). Susannah Weed, daughter of Jonas Jr. and probably granddaughter of Jonas, married Joel Raxford on July 2. 1795: Jonas and Mahitable Weed deeded a parcel of property to their son Nathaniel ,"for love and affection." 1800 Census showed Jonas and Nathaniel Weed living next door to one another on East River Road, but does not record Ezra Weed living in town. 1801: According to the Tiffany record, the Weed heirs sold property C-16 to David Lee. This property included a log cabin on the west side of the Farmington River Turnpike, diagonally across from C-15x. 1803: Jonas and Mahitable Weed deeded another parcel of property to their son Nathaniel ,"for love and affection." 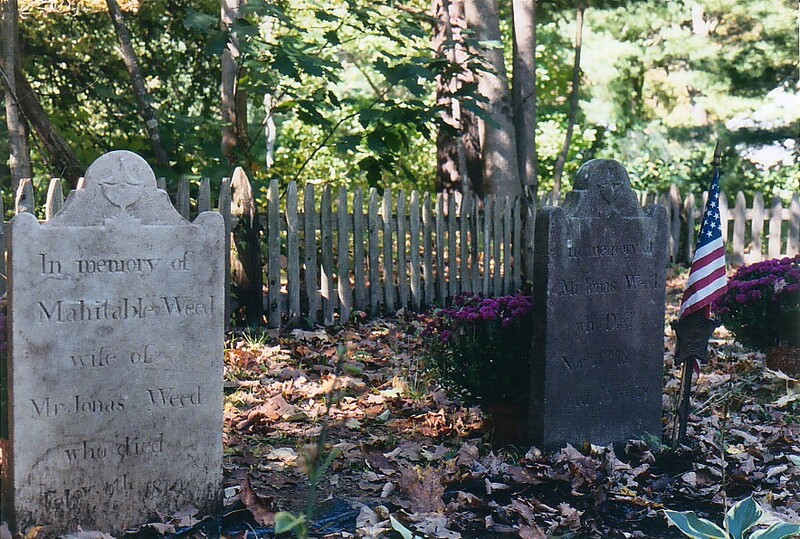 1806: Weed died on November 4, 1806, at age 79, and was buried "a little north" of his house on the Farmington River Turnpike, in the cemetery that is now part of the 79 East River Road property owned by Pat Steier, proprietor of the PS Art Gallery in Litchfield. 1809: Nathaniel Weed sold land to Micajah Weed on November 9. 1810: Micajah Weed of Vermont sold David Lee 40 acres with buildings (lot C-15x) ,it being where Nathaniel Weed lived, according to the Tiffany record. The census for 1810 showed Nathaniel and Daniel Weed living next door to one another on the Farmington River Turnpike. 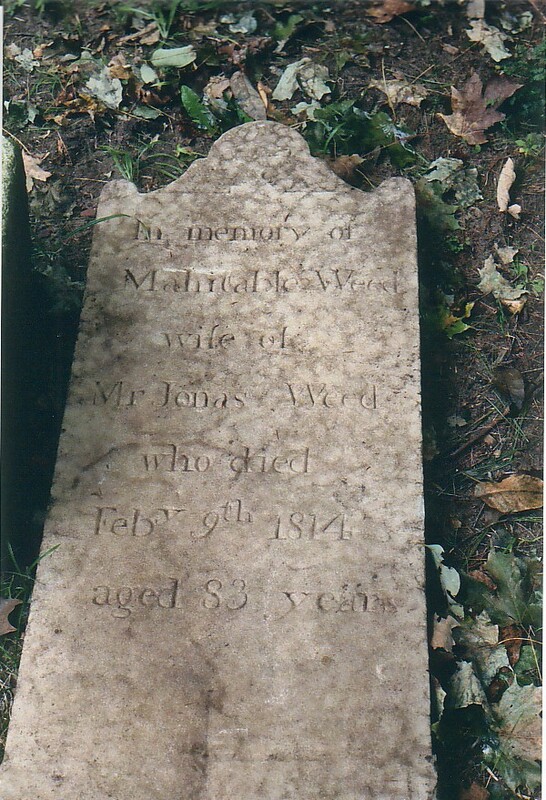 1814: Jonas Weed's wife Mahitable Perry died on February 9, 1814, at age 84. 1818: Pensioned, according to military records. Several questions arise from this material. For instance, there appears to be confusion in these records between Jonas and Jonas Jr. Are Jonas Jr, of Old North Road, and Jonas, of East River Road, in fact father and son? We can see from genealogy research on the internet that there were a great many men in Connecticut in the seventeenth, eighteenth, and nineteenth centuries named Jonas Weed, and the relationships are difficult to sort out. Then there is the question of the military records to which Jonas do these records refer? The Jonas buried on East River Road has a marker for military service next to his headstone, and Doug Roberts post a flag there each year to commemorate his service. But military records indicate Jonas living on North Country Road during his service, and being pensioned in 1818. Could these records all pertain to Jonas Jr. instead? Or perhaps the records pertain to both Jonas and Jonas Jr, with the indiscriminate use of "Jr" making them nearly impossible to distinguish today. A discussion with Doug Roberts November 18, 2002 indicated that David Lee and other Lees may have been buried in the cemetery.